Meghan Markle found fame playing the part of Rachel Zane in popular legal drama Suits, but it was her recent wedding to the world’s most eligible bachelor that saw her become a household name. 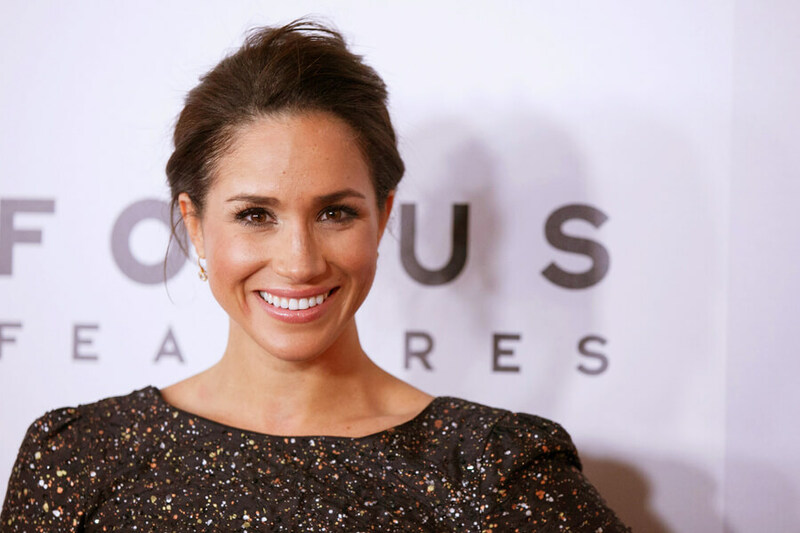 For the American-born actress, marrying Prince Harry was a dream come true – but becoming the Duchess of Sussex comes at a cost. Although she was footloose and fancy free prior to the May nuptials, Markle is now expected to stick to some tried and tested royal rules – including what she can and can’t wear. Join us as we give a kiss goodbye to some of Meghan’s most memorable looks. What will you miss most? Getting together with a British prince is one thing, but marrying him is an entirely different kettle of fish. Prince Harry and Meghan’s relationship was officially acknowledged in November of 2016 when Harry released a statement asking people to stop directing abuse at his new beau. At this point, Meghan was still active on social media and could still wear what she wanted. 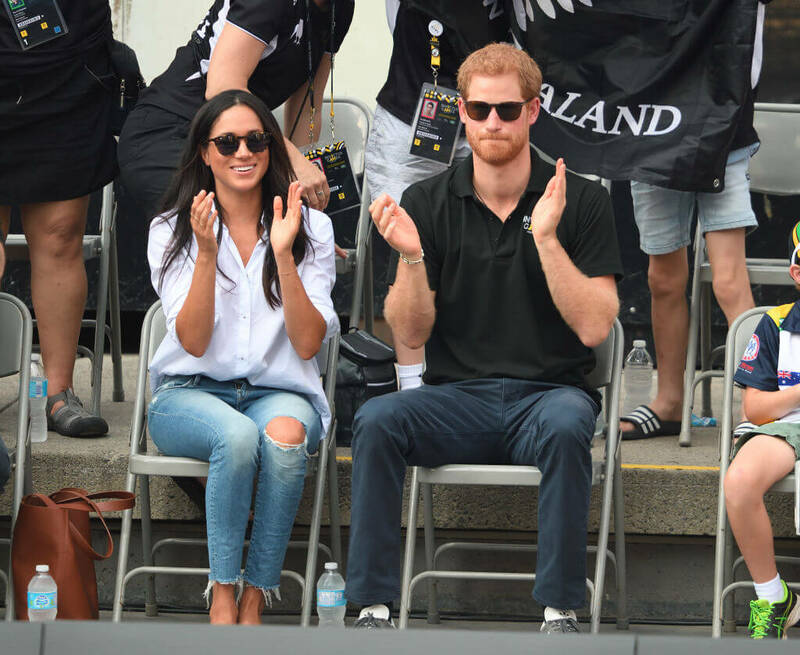 Pictured here at the 2017 Invictus Games, Meghan wears a perfectly lovely pair of ripped jeans. Just over a month later and Harry put a ring on it, putting a nail in the coffin of Meg’s casual wardrobe and bidding farewell to those adorable mom jeans. Like most young women, Meghan liked to dress the part – especially when attending fashion shows. In comparison to some of the A-list elite, Meg has always dressed relatively modestly. Even this black co-ord she wore to the Herve Leger show at New York’s Fashion Week in 2014 was understated and elegant, but it still wouldn’t fly these days. Why? That teeny tiny little bit of midriff on show is enough to send the Windsor house into a scandalous frenzy. This may be 2018, but a Duchess mustn’t show any skin you know, it’s strictly forbidden under Liz’s watchful eye. You might think this one is a little bit ridiculous, but trust us, Her Majesty doesn’t. When it comes to manicures, Queen Elizabeth II likes her family to keep it sophisticated and simple, meaning natural shades only. Unfortunately for Meghan, that means she can kiss her favorite dusky grey and burgundy polish goodbye. Even if it matches the outfit, it’s a massive no-no and would get her in big trouble with her grandmother-in-law. Meg wore this dark grey shade in 2012 to the InStyle awards, matching a skin-tight silver dress. Both the nail polish and the dress have been banished from the Markle wardrobe indefinitely. Most of us have thrown on a pair of leggings and piled our hair into a scruffy bun to go about our every day business on the odd occasion, and it’s likely that Meg was no different…but that was before she became Duchess of Sussex. These days, the duchess has to look perfect at all times. Markle is pictured above taking part in a charity game with Serena Williams in 2014, but those days are long gone. Could you imagine the Duchess being photographed running errands in sports wear? It just wouldn’t do. The only running Meg has to do now is to the next regal event. Over the course of her career in the limelight, Meg has worn many smart shirts with a casual twist, usually pairing them with high-waisted jeans. Although unbuttoned shirts make for a good fashion statement, they’re not accepted in the royal household. Her Majesty is all about modesty and keeping up appearances, and if it wasn’t done in her day, then it certainly won’t be done in yours. Just look at the likes of Kate Middleton, have you ever seen her with a few buttons undone for the sake of style? The answer is no, and it’s not likely to happen any time soon. 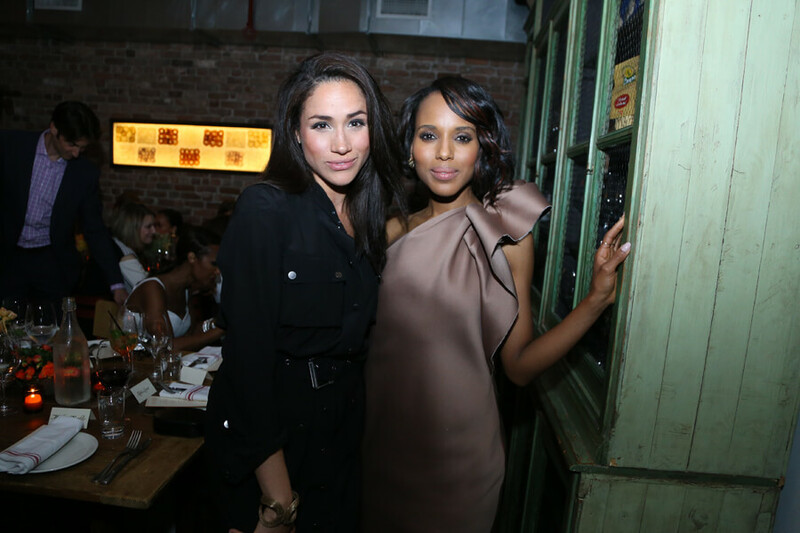 In her Suits days, Meghan had to attend multiple events for the sake of promoting the show. Usually, she looked like she was having a blast getting glammed up and hitting the red carpet with her co-stars. With those days behind her, she can always look back at the photos and recall memories of killer outfits in the past. Although this outfit is tame by modern standards, there’s one thing that she won’t be doing again any time soon – the sheer blouse. Sheer materials won’t be able to sneak their way into the Duchess’ closet now, but it was nice while it lasted, wasn’t it Meg? You might think that royals have been wearing bare legs for eons now, but it’s all an illusion designed to trick you! Or, more specifically, pantyhose. It’s a well-known rule that Ma’am expects her family to fall in line and cover up their legs in sheer stockings, but Meg went against it for her official engagement pictures. Prior to becoming a Duchess, the actress often had her impressive pins out on display when she attended events, but it’s unlikely we’ll ever see them flaunted so proudly again given her change in circumstances. That luxury is saved exclusively for Prince Harry. Daring ensembles and the British royal family aren’t exactly synonymous with each other. Unfortunately for Meghan, her days of plunging necklines are over. These days, it’s all about those sweetheart cuts. Just a few short years ago Meghan didn’t think twice about wearing an outfit like this. Meghan’s style overhaul since her May nuptials has been largely aided by her sister-in-law, Kate. There’s even rumors that some of the same designers dress the pair, with the Duchess taking a leaf out of Kate’s book to get inspo on everything from shoes to hats and hairstyles. You can’t go too wrong with K-Mid’s solid guidance. We have to admit that this one may be a blessing rather than a curse. Sequins have their place, but if not done well can come off looking a little too Disco Dave for our liking. Meg hasn’t rocked the look many times, but she did for one event a few years back. When it comes to formal events now, Meghan is expected to go for a quietly sophisticated, stylish look – not something quite so in-your-face as all-over sequins. They might seem relatively harmless to you and I, but think about it – when have you ever seen a royal in sequins? They say that black never goes out of style, and they’re not wrong, but for royals, it’s a different story. “Generally it is thought that black is not usually worn unless in mourning, although Diana Princess of Wales did occasionally wear it for evening functions, and The Duchess of Cambridge has been known to do so,” said an insider. Meghan has also ignored the rule on a couple of occasions, so who knows – maybe Her Majesty is getting a little more lenient on this one particular past time in her old age. After all, Queen Victoria wore it for the majority of her life. When it comes to jewelry, there aren’t really any hard and fast rules for the Royals to follow, but it goes without saying that big chunky bangles and statement pieces aren’t really favored. For everyday wear, Meghan would be expected to keep it simple, especially when it comes to bracelets and rings – not that she needs anything else with THAT wedding band. Of course, royalty loves a little diamond here or there, so it’s not unusual for important events to come with a little sparkle, but these are 100% legit pieces that cost more than our houses, and not the kind you find at the mall. When it comes to bright outfits, Meg usually pushes them to one side in favor of the usual darker hues, but she has been known to go for a pop of color every now and then. Eagle-eyed fans will notice that her color palette has changed since tying the knot. From beige to pastels, the Duchess keeps it neutral most of the time, although she has been spotted wearing an electric blue dress to an event with her hubby. It’s unlikely that you’ll ever see her wearing bright colors while attending the same event as the Queen though, as it’s an unspoken rule that Her Majesty needs to be the most eye-catching. With legs as good as Meghan’s, it’s no wonder that the brunette beauty had the confidence to walk the red carpet in skirts dangerously short. Pictured here in 2012, 32-year-old Meg wouldn’t have had a clue what life had in store for her and her beloved clothes. Prior to May 19 2018, Meghan used to rock off the shoulder or strapless dresses all the time. It was probably one of her staple looks, as she showed up to numerous events with her collarbone on show. We don’t blame her, the style suited her athletic frame down to a T, but you probably know where this is heading. Yes, it’s not Victorian times and no one shudders at the sight of a woman’s ankle anymore, but a little flash of the flesh is too much for Her Majesty, who prefers women to demurely keep them out of sight. We’ve touched on sportswear already, but there’s another element to this that we haven’t discussed. Members of the royal family have to remain completely impartial to absolutely anything. They can’t even vote. When it comes to their clothing, it’s much the same. You won’t ever see a royal rocking a Nike sweatshirt and there absolutely won’t be any sponsored jerseys like Meg is wearing above. It’s up to them to be completely neutral for the sake of Queen and country, which is probably a little annoying if you’ve spent years compiling a solid wardrobe of branded gym wear and the like. Meg has been a fan of Christian Louboutin and his famous red bottoms since she first started walking the red carpet. Some of her choices have been towering heels that even the best of us would struggle to walk in. It’s not forbidden for royals to wear pumps, but Meg will have to watch the style of them moving forward. Everything from the height to the material needs to be in line with the new wardrobe guidelines. In short, we’re thinking less Dita von Teese and more von Trapp. Plus, meeting legions of adoring subjects is a little difficult tottering around in five inchers. Wearing a pattern can be a daring choice for any Hollywood-ite to take. There are all sorts to think about, for starters, will it clash with the red carpet backdrop? Will the design translate in pictures well? Meg hasn’t ventured too much into this particular fashion niche in the past, and she isn’t likely to again. When it comes to being a Duchess, less is certainly more. In-your-face geometric patterns like Meg is wearing in this 2013 snap won’t be high up on the agenda. It’s simply too much for a distinguished royal to present. If it’s not plain, then it’s not worth it! We’ve all got our fashion habits, and some of them die really hard. The Duchess formerly known as Rachel in Suits is no different, having worn a jacket draped over her shoulders several times in the public eye. What can possibly be wrong with this fashion choice, you ask? Traditionally, no female member of the royal family is permitted to take her jacket off (wholly or partially) in public as it’s deemed “unladylike”. So, the likes of Kate and Meg have to follow the Queen’s example and keep a coat on no matter the temperature. Of course, they’re quite savvy with this and wear light materials in the summer months. Meghan loves a dress as much as the next girl, but she has also been known to rock a good pair of pants. At this NBC event in 2015, she opted for a wide leg white pair that weren’t the most practical, but certainly looked good. Pants aren’t specifically banned for her from now on, but when it comes to attending formal events – daytime or otherwise – it’s largely expected that she will wear skirts or dresses. A duchess must be the picture of feminine grace, and clearly, the Royals believe this can only be properly achieved when ditching pants. Meghan has always loved designers from her home country, as well as Canadian brand Mackage. The outerwear company saw their sales rise as Meg continued to wear their pieces throughout her engagement to Prince Harry, but they’ll likely be in for a shock. All members of the family are encouraged to keep their clothing designers local, by opting to wear British brands only. Although there are some exceptions, it’s not uncommon for the younger generation to go for the lesser-known designers to try and give them a bit of a leg up in the industry, so perhaps the Duchess can find a new favorite. Now that you’ve seen what ways Meghan Markle can’t dress anymore, let’s talk about some old outfits she would get kicked out of the family for wearing today. This stunner she wore in 2012 would never fly in the royal house. Can you count all the ways this outfit is failing her? First, look at the plunging neckline! Have some decency Meghan! The same can be said about how much leg she’s showing without pantyhose. How scandalous! Finally, is that black nail polish she’s wearing? Yes, it is. You don’t need to see the whole outfit to know what Meghan did wrong here. In 2013, she showed up to the Golden Globes in a sequin dress. These days, she’d kicked out of the family if she showed up to a formal event looking so shiny. Really, though, losing the sequins is okay with us. The shine of her dress only works to take away the radiant glow she’s giving off while smiling. Sometimes less truly is more! Keep It On The Shoulder, Please! We can’t tell if she’s breaking the five inch pump rule with her shoes, but we know she’s definitely breaking the no shoulder rule in this 2013 gown. It doesn’t matter how elegant you think she looks, the Queen would never let her out of the house without her shoulders covered. 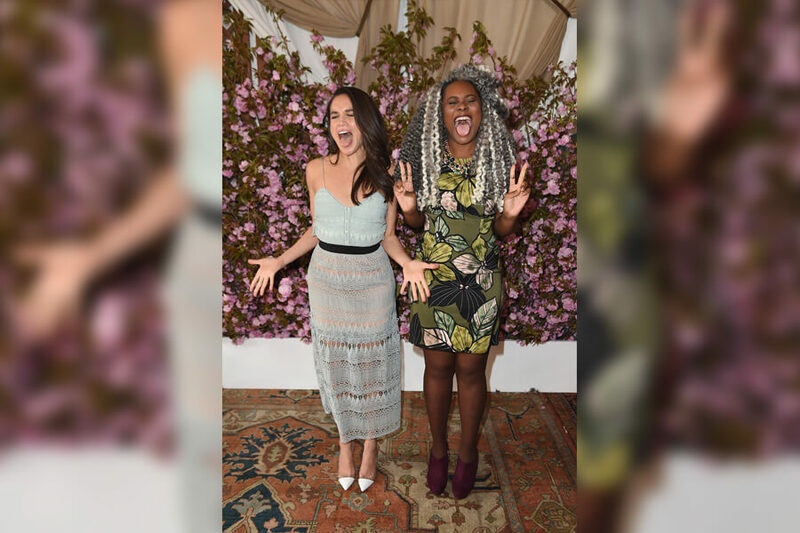 Markle got away with wearing this dress to the ELLE’s Women in Television Celebration in West Hollywood. At the time she was one of the main cast members of the show Suits. These days we’re not even sure what kind of suits she can wear. There are at least two things wrong with this 2013 red carpet dress. First, and most obviously, there she goes showing off her shoulders again. Secondly, would you call this a “gaudy” pattern? If it’s not, it’s close enough that she should probably donate the dress to Goodwill. We wonder what her outfit would be to this event in 2018. Would she even be invited? This was, after for, an event for the Screen Actors Guild and she is no longer a member. Everything else about the outfit would work just fine. You can’t see her shoulder and there’s no black nail polish we can see. Mostly a good job! If only her dress was a different color. Taken in New York City five years ago, Meghan Markle wouldn’t want to go out on the town dressed like today. Not only is that pattern very, very gaudy, but her heels are too high and her knees are showing. The thing we noticed first was the heels. You can measure if you want, but we’re confident they’re more than five inches. The colors of the dress are nice, but the pattern doesn’t pass the eye test. And of course, her knees are never allowed to be seen, and they’re on full display here. Dipping into the 2014 vault of Meghan Markle outfits, there are at least three things wrong with this one. Two of them should be obvious, the other one, maybe not so much. Obviously, Meghan can’t wear pants to formal events anymore. She also can’t be seen in all black. That’s two down, can you figure out the third? One of her layers is sheer, which simply never acceptable for a royal. We hope the duchess wore this outfit as much as she could before it became unacceptable. You might not call Meghan Markle’s neckline plunging here, but we have a sneaking suspicion the Queen would. On a non-royal note; tucking a casual business shirt into a dress might have been trendy in 2014, but not anymore. Now that we’ve talked about that neckline, let’s talk about that skirt! We think, like the neckline, there might be too much pattern going on here for the Queen to give Markle the okay on this outfit. Just pick a color and stick to it! This picture was taken in October, 2014 and we bet the Queen wishes this was Meghan Markle’s Halloween costume and not event wear. Unfortunately, Markle wore this to the 60th Anniversary Guest Chef Dinner Launch at the Consulate General of France. The pants are a clear can’t do, but don’t forget the Duchess is not supposed to wear jackets draped over her shoulders either. What, exactly, is the jacket hiding Meghan? Bare shoulders, perhaps? Probably not, that shirt looks royal appropriate to us. Meghan Markle tried to get away with wearing this shoulderless dress in 2014 but forgot that she’s not supposed to wear draped jackets too! Her dress is also black. It really is amazing how much can be wrong about one simple and elegant outfit once you join the royal family. Is anything else wrong with this one? Her shes might be too high, but they seem fine. He wrist bracelet isn’t overly flashy either, and she’s not wearing black nail polish. Too bad she still needs a wardrobe change. Showing off for a Prada event in 2015, Meghan Markle should has spoken to the Queen before stepping out in this. We know shes wasn’t a part of the family then, but we wish the Queen had stepped in. First off, the pattern on those pants is interesting. Secondly, it doesn’t match the pattern on the shirt. At all. Markle might have been a fashion icon before becoming a Duchess, but this is one outfit she probably should have put back. There is too much costume jewelry here for us to care about Meghan Markle’s actual outfit. We won’t even get into her clear purse/phone case contraption. Let’s talk about her rings first. Those are some big rings. Far too showy for a modern day royal to go out in public with. Then there’s the finger nails. Markle loves black nail polish, and it’s sad that she can’t wear it anymore. Surprisingly, the only thing acceptably royal here is the clear class purse/phone case. We think Meghan Markle looks absolutely stunning in this 2016 photo shoot at the Fairmont Royal York Hotel in Toronto. The Queen would have major problem with this outfit though. That is one of the most plunging neckline we have seen on this list. Markle really knows know fear when it comes to fashion. Sadly, she will never wear a dress like this again as long as she’s a member of the royal family. The Queen won’t allow it, even for an extravagant photo shoot shoot like this one. It’s good to see Meghan Markle literally having fun with fashion here. She looks exuberant in this sheer, spaghetti strapped dress. The Queen would throw an absolute fit if she tried to leave the house looking like this today. Is it sad that we equate the Queen’s possible reactions to her new granddaughter’s outfits to that of an overprotective parent of a teenage girl? It just seems to fit in the case of Meghan Markle’s life in fashion, then and now. Meghan Markle took us to Heaven in this outfit. It’s only fitting she’s posing with wings, looking like the angel we know she is. Of course, to the Queen, this outfit is more devil than angel. Not only is Markle showing off her legs, she’s wearing shorts while she does it. If that wasn’t bad enough, her shirt is just too open for the Queen’s liking. Oh, the heels of her shoes look about an inch too high, as well. Someone shopping at a thrift shop is going to get very lucky when they pull this off the rack! This picture might be a little dark, but that dress is radiant red. And you know how the royal family feels about bright colors. Markle might be able to get away with this dress for a night on the town with her hubby. Going on a family out like this would not be allowed though. Never forget, the Queen is supposed to be the most radiant member of the royal family. She is allowed to wear bright colors too stand out from the crowd. Everyone else needs to keep their colors muted, something this dress is not doing. Here’s Meghan Markle in 2017 at the Invictus Games in Toronto. She’s getting closer to her royal wedding here, but still not making the best fashion decisions. We wonder how many times the Queen has had to tell her not to wear her jacket draped over her shoulders. Markle does seem to have realized her that her neckline is showing and is doing her best to hide it. Or something really shocking just happened! Either way, this outfit was okay in 2017, but not anymore in 2018. We’re taking you all the way back to 2006 for this photo. 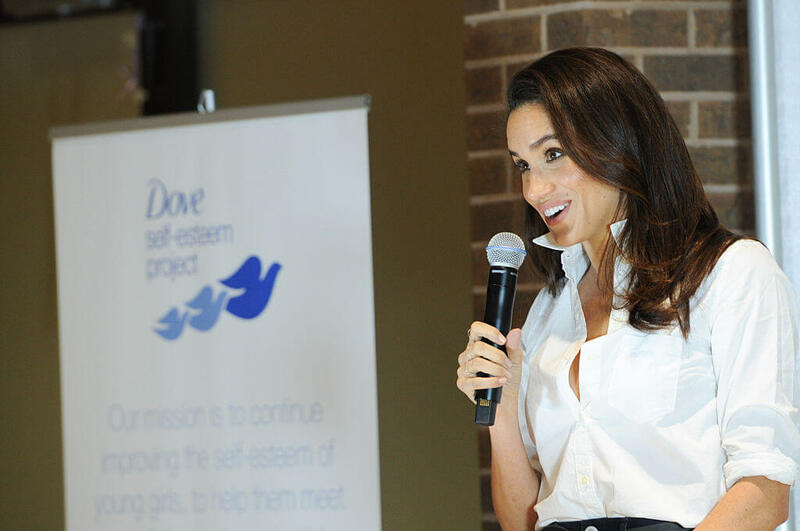 Meghan Markle wasn’t a fashion icon yet and still loved going out in her jeans. This was acceptable over ten years ago. Today, if she showed up to a fundraiser for the National Kidney Foundation, she would have to dress to impress. The good news here is that her jeans aren’t ripped. That’s a definite royal no-no. The bad news us that necklace is way to big for her outfit. No costume jewelry allowed! When Meghan Markle got married, she had to hide her something blue. At this Golden Globe party in 2012, she got to show off her something blue loud and proud. Unless you think it’s purple. It might be purple. Or blue. Have we started the next great debate. Whatever color the dress really is, it’s too bright to be seen in the royal family. Her shoes are making the same color mistake, although they do look short enough for the Queen’s liking. Her wrist bracelet though should probably have been left in the car. When we first looked at this outfit, we though it was perfect. 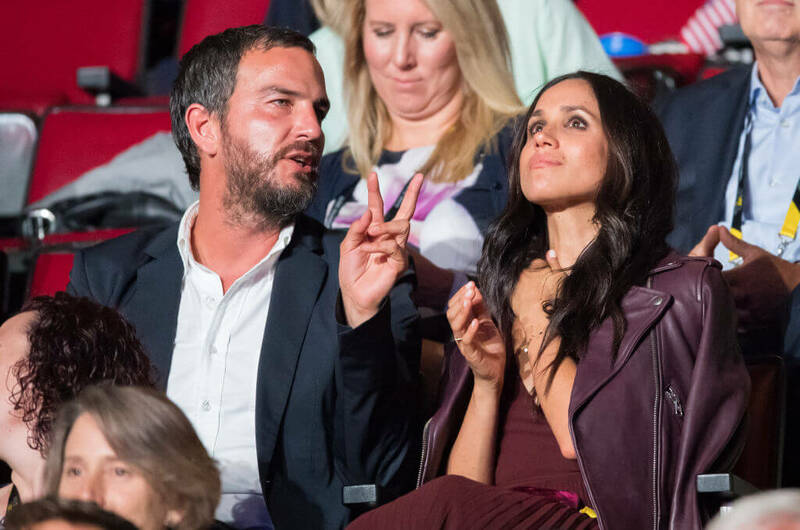 It looks like everything Meghan Markle would need to be acceptably royal. Then we took a closer look. You can see her knees and she’s not wearing pantyhose. Once we noticed that, we noticed we also saw her black nail polish. On the bright side, her outfit isn’t bright at all! And her shoulders are covered and zero neckline is showing. Can’t we just give her this one as a successful outfit?